As promised, my presentation from the opening Excemed medical education satellite symposium this morning at the European Charcot Foundation meeting in Baveno. 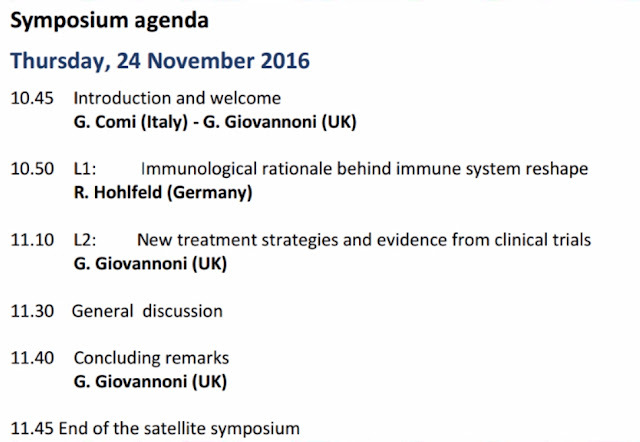 I followed an excellent talk by Professor Reinhold Hohlfeld on the reshaping the immune system as a treatment strategy for MS. He used myeloablative HSCT as the example underpinning his talk. 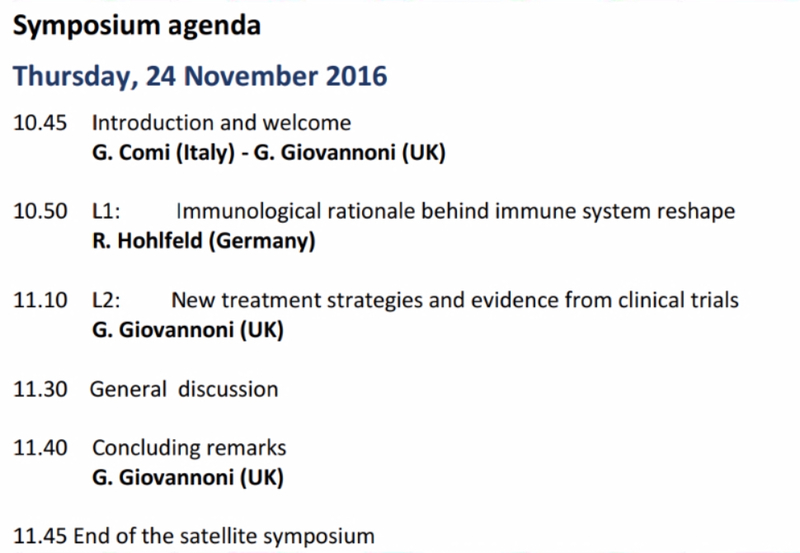 In comparison, my talk covered the treatment strategies that are currently being used in MS. I focused on the immunosuppressive agents, highligting the differences between maintaince and pulsed immunosuppression. I got very good feedback from the talk with several delegates requesting my slides. Gavin – looks like a great talk but small print difficult to read on line. Do I understand correctly you do not consider Teriflunomide an immunosuppressant, if not why not? Re: " Teriflunomide an immunosuppressant, if not why not?" Because Teri doesn't tick the boxes for being an immunosuppressant. It rarely causes persistent lymphopaenia, it has not been associated with opportunistic infections, vaccine response to component vaccines are maintained and there is no secondary malignancy risk. A lot of very good slides – I liked the one about the treatment burden to the patient… it is difficult to take a day off every month for Tysabri, for example, without anybody noticing. As for Tysabri… de-risking program is nice, but it does not seem to take the number of PML cases down to 0 ( or even considerably down). The neurologists feel safe (they are following the rules from Biogen). But what if a patient has had low lymphocyte count for some time on previous treatment and is JC virus positive … Low risk of PML for the first two years and then … welcome to the trouble zone. Unfortunately there are a lot of perverse incentives still in place to prescribe natalizumab to JCV positive patients and to keep patients who are JCV positive on natalizumab. I am of the opinion that now that we have alternative options all patients who are JCV positve should be on another treatment. I agree with anon:24.11 and the matter of this slide. I'm lucky enough to have a very comprehensive hierarchy, also keeping the amount of people who know to a minimum. But I'm aware that this is not the case for everyone. Being JCV- and asking my neuro about the switching strategy if i'm tested + one day, he told me that we won't switch if the titer is below 0.9. According to the data I've seen here and there, it seems pretty safe to me (1 out of 10000 if I remember correctly). What's you thought about that? Btw, the answer was Fingo. Totally agree with prof G here and I am JC virus positive and I am am fighting my neurologist with vim and vigour to get either rituximab or Lemtrada (actually the preferred option – because of dosing, lower risk of infections long term and better results. Wish me luck! Hi ProfG, would you be able to clarify the rather scary graph on slide 45? The one showing "proportion free of wheelchair"? I am not sure how to interpret it. It looks like it's saying that *everyone* with MS becomes rapidly disabled by mid 40s and that no MSers are free of wheelchair from approx age 45. Surely that can't be right? Not everyone is that disabled by 45 surely? There must be some proportion of MSers who are doing okay. There must a fair few pwMS age 50+ who are still able to walk? Maybe only a minority but surely a statistically significant proportion nonetheless? I had hoped the odds of postponing my rubber-rimmed chariot were a little more favourable than 0%! Or perhaps I am just being naive about how severe the prognosis is… Apologies for seizing on one minor detail – the rest of the slides were interesting too! Slide 45 refers to the group of pwMS who donated their brains to the MS Society brain bank. This is a highly selected group of pwMS. Not worry James, I'm 54 and can still walk – even run a bit! Have had RRMS for 17 years. Thank you. Why is NEDA a reliable metric for efficacy of maintenance therapies but not of induction therapies? What is the difference? Re: "Why is NEDA a reliable metric for efficacy of maintenance therapies but not of induction therapies?" If you have breakthrough activity on a PIRT it is an indication to retreat; for example ~40% of pwMS need a 3rd or 4th cycle of alemtuzumab. If you breakthrough on a maintenance therapy and you have been adherent then it is an indication to switch/escalate to another DMT. Thank you, that makes sense. I think I remember reading that Barts hospital treated a few post lemtrada relapses with things other than lemtrada – what would considerations would go in such choices? RE: "…a few post lemtrada relapses…"
There a few patients who are non-responders to alemtuzumab; when you give the drug they don't deplete their lymphocytes. These patients have neutralizing anti-alemtuzumab antibodies. In one case we have used rituximab and another subcutaneous cladribine. Going forward drugs that are not that immunosuppressive would make sense, for example ocrelizumab or daclizumab. Another option is to de-escalate and go for one of the platform therapies, for example teriflunomide. So a non-responder to Lemtrada is based on lymphocytes levels failing to deplete? Not on the drugs ability to halt or slow disease progression? In terms on ~40% needing 3rd or 4th treatments, were they all then NEDA for some time thereafter? Prof Giovannoni, thank you again. Last questions – would you expect that measuring neurofilments through LPs could conceivably catch inflammation before lesions are seen on MRI, and would you be comfortable making re-treatments decisions on basis of neurofilments? Would pet scans give any more information in this context in context with LPs or not really? Sorry for all the questions.. So a non-responder to Lemtrada is based on lymphocytes levels failing to deplete? (as Life Goes On asks) Really is this true?, as I have some doubts about it. Given that all of the effective DMTs may have serious and life-threatening AEs, wouldn't it be reasonable to assume that daclizumab will be eventually get approved by NICE given that it's quite effective and doesn't seem to be associated with SAEs? From the slide where you compare induction with maintenance treatments, you weigh a lot towards induction DMTs. Am I mistaken that you have a strong preference towards them? is at least one line missing from the slide comparing PIRTs and induction therapies. One is a line about how long it takes to see benefit from PIRTs. A pwMS who I know recently had Lemtrada and was told it might take him 18 months to get back to where he was before the treatment (after that he should continue to see improvement). Another close friend of mine had two courses of Cladribine early in the summer and has since seen a huge deterioration in their physical state. You don't even mention how long PIRTs take to work. Re: "… One is a line about how long it takes to see benefit from PIRTs." Unfortunately, not all patients respond to PIRTS. The breakthrough rate varies; being lowest for HSCT and alemtuzumab. 56% of subjects in the CLARITY study (cladribine in RRMS) had some disease activity in the 2 years of the trial. The number of subjects with activity reduced with each time epoch studied. In the low-dose arm, in the first 6 months a third of subjects were active, in the second 6 months 15% were active and in the second year only 7.5%. So it takes time to respond; this is why we need to rebaseline. It is not appropriate for us to respond and discuss individual patients online. But I agree problems arise when patients are active on PIRTS before they can be give additional doses. For alemtuzumab we often move forward the next dose by 3 months; i.e. we administer the 2nd or 3rd course 3 months earlier. With cladribine factors like lymphocyte counts etc. need to be taken into account, but earlier treatment with another course is possible. If you look at the algorithm there is an arrow that allows you to switch strategies and to start a maintenance therapy. Based on the Leist et al. 2014 data in the optic neuritis trial most of the disease breakthrough occurred within the first three months with oral cladribine.